There are many people who, when eating fish, prefer not to notice that they are eating fish. Then there are others who savour every fishy bite. Either type will love this recipe. 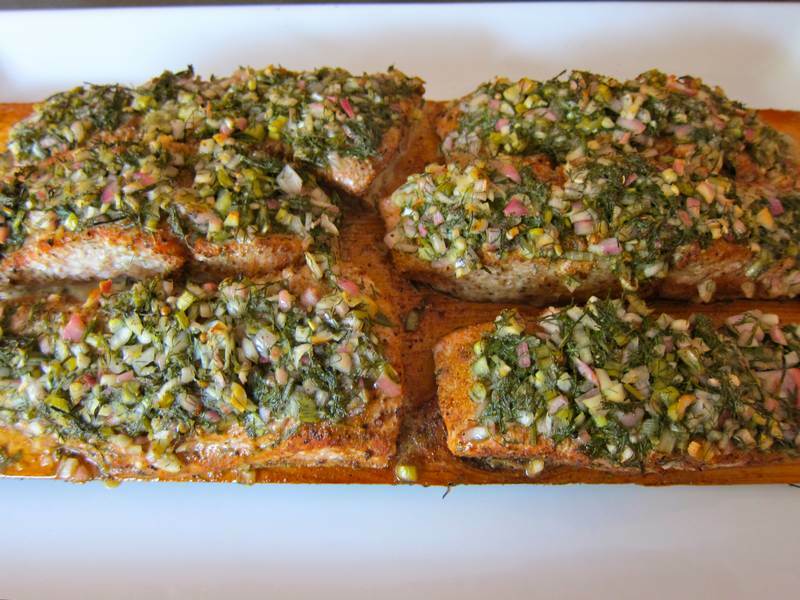 Cedar-Planked Salmon is Ted Reader‘s recipe in Napoleon’s Everyday Gourmet Plank Grilling cookbook. If you have the chance to watch him perform BBQ feats, you will become enamered of his style of cooking. The recipe below is slightly modified to suit my taste. Buy the book for the original and for its many other wonderful recipes. Preheat grill to medium-high heat. Place the salmon fillets on the plank. 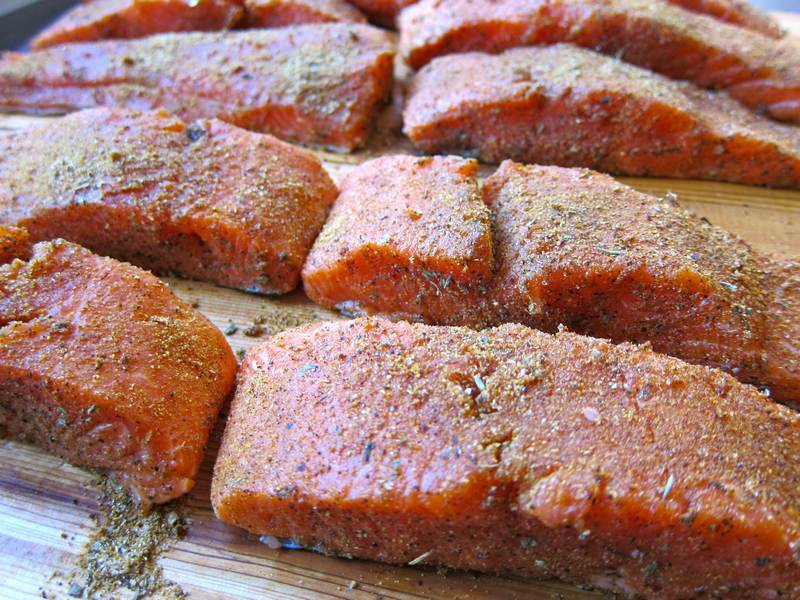 Season salmon fillets with BBQ Seasoning; set aside. 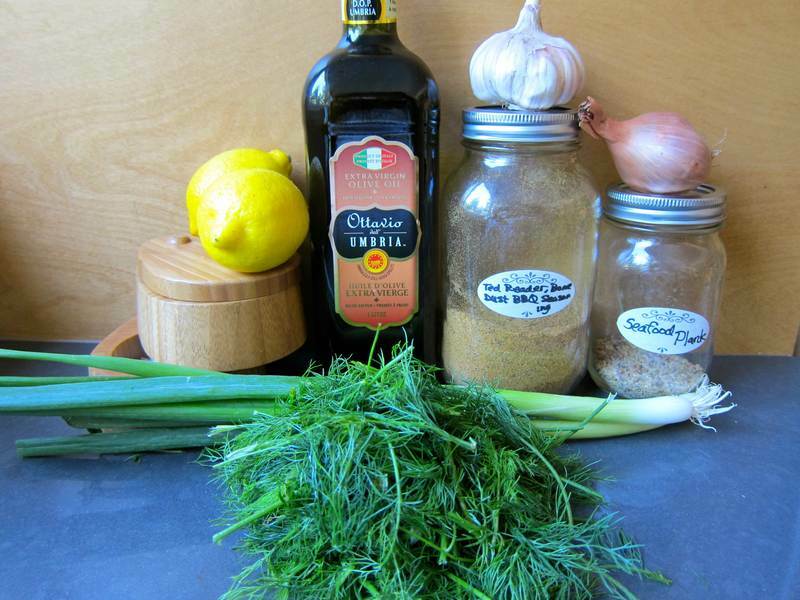 Mix together the garlic, scallions, the lemon juice, dill, shallots, salt and olive oil. 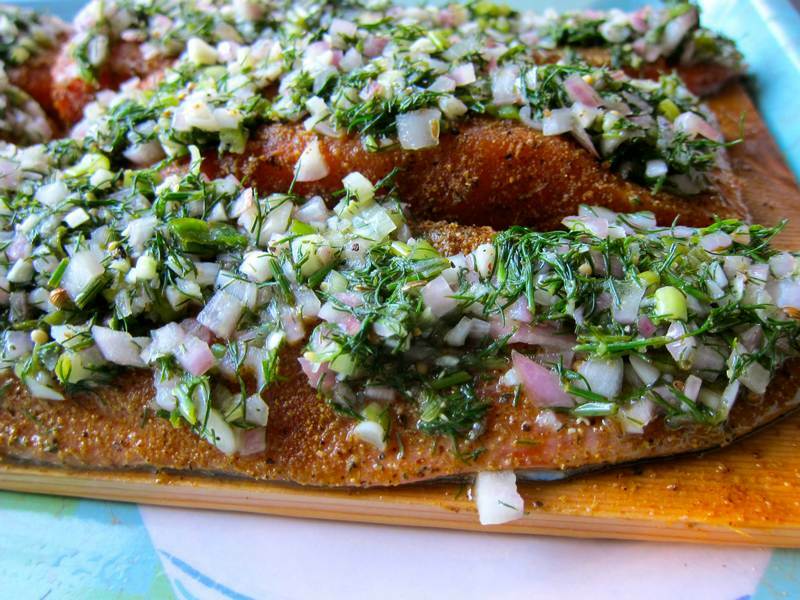 Spread the dill mixture evenly over the salmon fillets. Mix all ingredients and store in a cool dry place. Makes about 2 1/4 cups. A year ago we had a large family reunion and Ted Reader’s Cedar-Planked Salmon was a huge hit. The many compliments and requests for the recipe likely sparked the Jittery Cook blog. Thank’s Ted! I don’t feel too guilty sharing this recipe as it is included in the packaging for the Ted Reader’s cedar grilling planks. The Poissonerie du Marché Atwater provided perfect looking and perfect tasting wild salmon. Yes, you can taste the difference between farmed and wild. I’m one of those who savours every fishy bite. : ) and I love the sounds of this spice blend for salmon! (Your photography is great too btw!) It goes on the *must try* list. Thanks for the mention and link to cooking-spree. I can never decide when it’s time to stop exchanging thank yous. Thank you too! I hear we benefit from eating salmon several times a week, so it helps to have many great salmon recipes. Thanks for liking and letting me know.